After being released from Israeli detention today, the Women's Boat to Gaza activists pledge to continue their efforts to end the occupation of Palestine. These pre-recorded words by Nobel Peace Laureate Mairead Maguire open a 2-minute video, released October 5, after Maguire and 12 female companions aboard the small sailing vessel the Olivia-Zaytouna were detained by Israeli forces about 40 miles off the coast of Gaza. 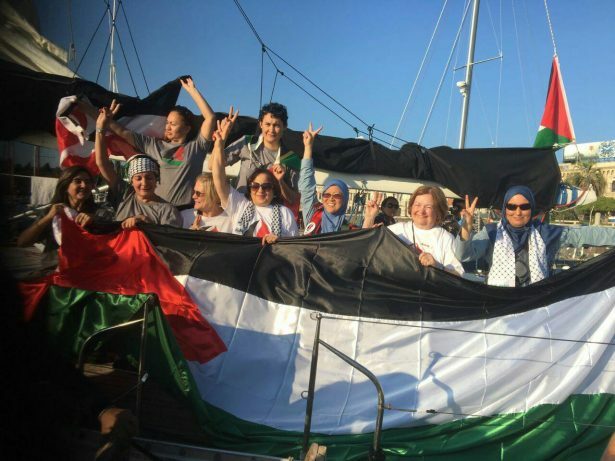 The women aboard the Zaytouna launched their single-boat flotilla on September 23 under the banner Women’s Boat to Gaza, the latest attempt by the Freedom Flotilla Coalition to break the decade-long blockade of the Palestinian territory. A diverse group of women boarded alongside Maguire, including retired U.S. Army Colonel Ann Wright and Malaysian gynecologist Dr. Fauziah Hasan. The women were well aware that their chances of actually reaching Gaza were slim. As the group neared the shore on October 5, spokeswoman Claude Leostic told the AFP “the Zaytouna-Oliva has passed the fatal line of 100 miles and everything is going well.” Within hours, however, several Israeli vessels surrounded the flotilla, boarding the Zaytouna and detaining those on board. The Israeli Navy reported that the intervention came after “exhausting all diplomatic channels” and that the detention proceeded without violence. On the Gazan beach that morning, Palestinians prepared to greet the flotilla, assembling with flags and banners on the shore, but the women were taken by Israeli forces to the Ashdod port and later held in Givon Prison. The use of flotillas to protest the siege in Gaza began in 2008, when a group of activists sought a way to defy the blockade using creative, nonviolent means. The group eventually decided to break the blockade directly by sending a flotilla to the port of Gaza, which had not been entered by an international vessel since 1967. After months of grassroots fundraising and organization, 47 activists representing 17 countries launched their mission in two small wooden boats, the SS Gaza and the SS Liberty. They were able to reach the Gaza port with supplies, including hearing aids for children whose hearing had been damaged in the sonic booms caused by military flyovers. Subsequent attempts by activists to break the siege have been less successful — and in some cases, tragic. In 2010, the Turkish vessel the Mavi Marmara attempted to reach Gaza with humanitarian aid, but when Israeli forces intercepted the boat on May 31, violence ensued. The clash left nine Turkish activists dead (a 10th would die later, after a years-long coma) and 10 Israelis injured. The event sparked international outcry, but it has not deterred organizations like the Freedom Flotilla Coalition and the International Committee for Breaking the Siege of Gaza, from continuing similar attempts to reach Gaza. The Women’s Boat to Gaza was the first all-female flotilla, and aimed to highlight the role of Palestinian women in the struggle for self-determination and the uniquely gendered effects of the occupation. Before the flotilla, Gazan women shared their perspectives on the siege through videos posted on the group’s site. The women of the flotilla have confirmed their physical safety throughout, and the last of the 13 activists were released today. Yet even as they depart, the women of the flotilla have reiterated their reason for sailing: to raise awareness of the dire humanitarian situation in Gaza, where 80 percent of the 1.9 million residents rely on aid to survive. The 10-year blockade has crippled the economy, reducing trade to 15 percent of its pre-siege levels, while power outages, food shortages, rampant unemployment and undrinkable water perpetuate a state of crisis. Thank you for waging peace, and demonstrating that there are people who care. May your actions be multiplied, and humane, loving, unity be the future of our global family. send a check by snail mail that may show some of my appreciation . Thank you for your work towards peace. Thank God someone is doing it.